The Sevan Mountains are the oldest standing in Armenia, weighing in at 380-1,200 million years old. Volcanoes and massive earthquakes formed the base of the mountainous region, carving mountains, valleys and plateaus on a land that now has an average altitude of 2000 meters (6,560 ft), with less than 10% of the country lying below 1000 meters (3280 ft.). 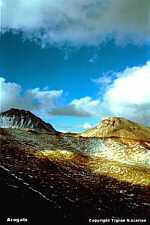 The highest point in Armenia is Mount Aragats (el. 4090 meters/13,415 ft.) Absolute elevation ranges from 450-4,090 m (1,476-13,419 ft) above sea level. Lying between continental plates, Armenia and the Transcaucasus continue to be subject to earth tremors, which in prehistoric times shaped the great rocky mountains in the Southern and Northern parts of the country. 34 mountain ranges crisscross the country, each protecting unique pockets of wildlife and terrain. More than 85 mountain peaks higher than 1300 meters (4,264 ft) grace the landscape. At the very first, check with ARMENIAN ECOTOUR, 32/22 Shinararneri st., 375038 Yerevan, Armenia Tel: (3742) 397 552 Fax: (3742) 151 795 E-mail: info@ecotourismarmenia.com, zhanna@freenet.am. The association is made up of members from all the ecologically based groups and operators in the country, and will point you to the best availbale. The site is an excellent introduction to the natural beauty in Armenia. AVARAYR, 1, P.Byuzand st., 375010 Yerevan ARMENIA - Tel. : (374.1) 563.681, 524.042 Fax. : (374.1) 563.681 - E-Mail: office@avarair.arminco.com Avarayr had an excellent reputaiotn for prividing specialized, acheological and adventure tours. They've done a poor jopb of promoting themselves, failing to include contact informaiton on their web site. IRCS SERVICES, Yerevan-88, Gevorg Chaush St. 50/1 - (374 1) 342 349, 358 341, 353 297 Director - E-mail: alexan@arminco.com, archotel@freenet.am - K. Z. Nurijanian, Director Rock Climbing, Hiking and Horse Expeditions, as well as providing Studio, 1 and 2 bedroom apartments on the site, 8 kilometers from centre. This money goes to support the efforts of the Trauma Therapy centre. Horse riding uses "Airudzi" horse center, with 18 horses of pure English, Anglo-Arabic, Traken, Tesin breeds as well as a Scottish pony.